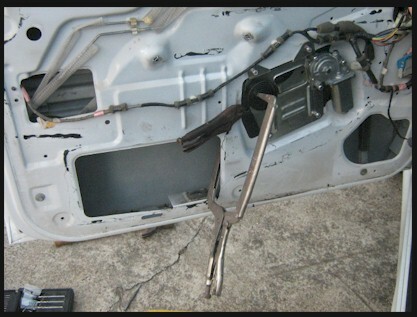 Window regulator spring removal and installation. Today I walked up to an apprentice at work to see him trying to put a spring on a window regulator with a screw driver, while another apprentice had a long pry bar against the spring so it wouldn’t pop off into someone’s face. They were amazed at how easy we installed this spring using an old trick. Like with anything we are trying to bend, pull, “manipulate” around a car, it takes CONTROL over all other factors every time to get the job done with the least effort. On this window regulator spring, the first thing is to take a picture of it, or at least draw a little diagram of how it goes back on! Nothing like staring at something like this after a day of hard work trying to figure out which way it goes. A digital camera helps a lot for stuff like this. You want to hold the spring onto the regulator so it doesn’t fly off, to do that simply put a large C clamp around the back of the regulator onto the front of the shaft that the spring is on. 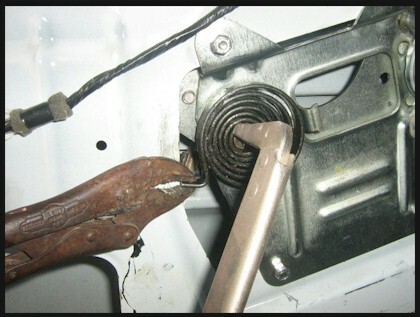 This shaft is going all the way though and you can clamp this clamp on there pretty firmly without damaging anything. Now you get a pair of vice grips and grab the end of the spring, you will have complete control as you pull the end of the spring off the hook that grabs it on the regulator. Like wise as the photos show, you have the same control to wind this spring back over to hook it on the hook where it belongs. Don’t forget gloves, and a face shield isn’t a bad idea either, I like all my teeth! I know it isn’t going to go flying, but I still put on my seat belts on the way to work and I know I am not going to have an accident too, right?